My first blog tutorial, how exciting! 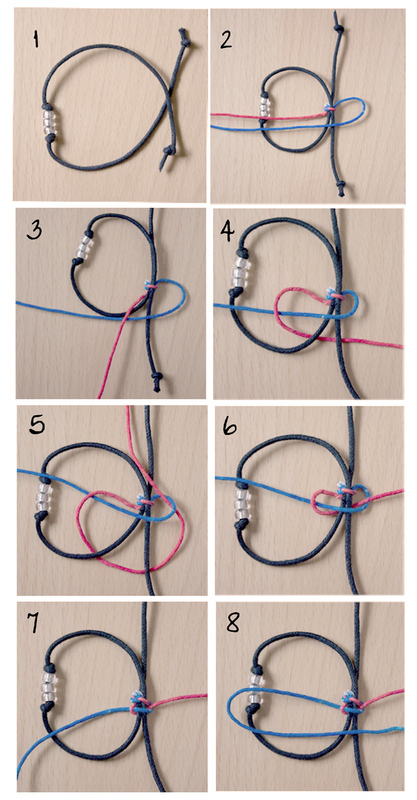 Loads of people have been asking about these knots, as seen on the already ubiquitous Shamballa bracelets, and how to do them. Whilst nothing beats having someone showing you in person, I did feel there was a lack of clear step by step instructions out there, so decided to do my own. 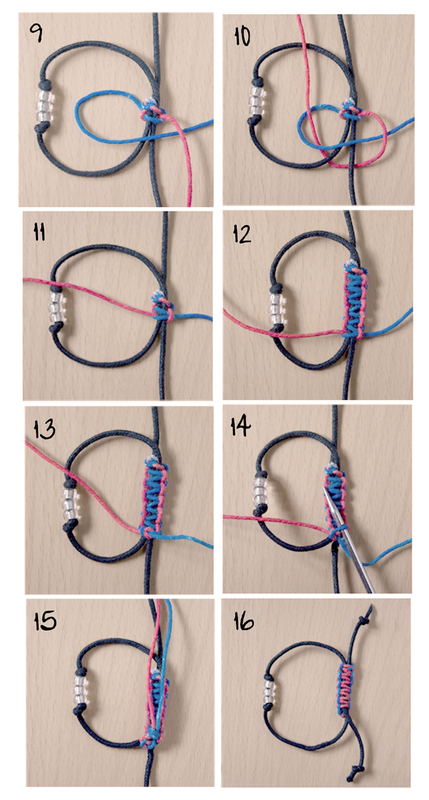 This tutorial is purely about creating the sliding knot itself, so the actual bracelet design isn’t very exciting, but you get the idea! It does seem a bit long, but I wanted to include an image for each step so it was fairly self explanatory. First thing to realise is that this knot uses one piece of cord for the bracelet and another to create the knot itself. I have used black for the main bracelet and for the knot I have tied a blue and red cord together, so there is a different colour for each side to make it easier to see, but normally this is just one piece of cord. Written steps are at the end of the images. 1. Lay out the bracelet, making sure you have knotted the ends – this both stops the finished knots from sliding off completely and helps you identify which are the main cords. 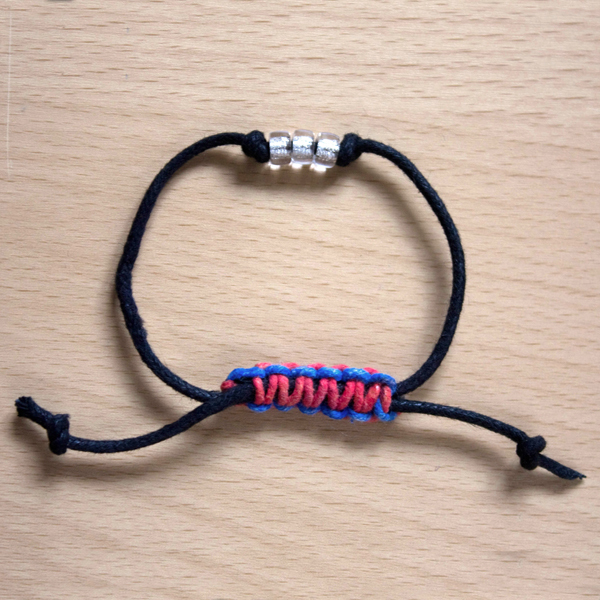 2.Tie your knot cord on using either a overhand or reef knot around the bracelet cord. Then take the right hand (in this case blue) cord and lay it across the bracelet, leaving a loop. 4. Take the left cord under the main bracelet cords (make sure you go under both bits). 6. Pull both ends together, checking it looks like the picture. 7. This is now one half of a square knot done. 8. We now repeat steps 2-5 on the other side. So bring lay the left hand cord across the bracelet, leaving a loop. 10.Take the right hand cord under the main bracelet cords and up through the loop in the left hand cord. 11. Pull to tighten. This is now one complete square knot! 13.Tie an overhand knot or reef knot. Try to do this on the same side as the one you did at the beginning making it your ‘working’ side. 14.To hide the ends, take then back under the last couple of square knots(if too tight, take a bradawl, knitting needle or even a kebab skewer to loosen) and cut off the excess. 15.Dab superglue on the ends and the reef/overhand knot. Be careful not to get any on the main bracelet, but if you do, keep pulling the main ends to free them. 16.Turn it round do the working side is on the inside touching your wrist. And that’s it! This is the best tutorial I've found. Thank you! Had to make one of these knots today and my goodness there are some bad tutorials out there. Yours is by far THE BEST! I learnt these knots easily. Thank you for sharing. Your tutorial is clear and simple. There are so many confusing tutorials out there using only black cord. Your colors stand out and clearly show where the cords need to go. It’s hands down the best.